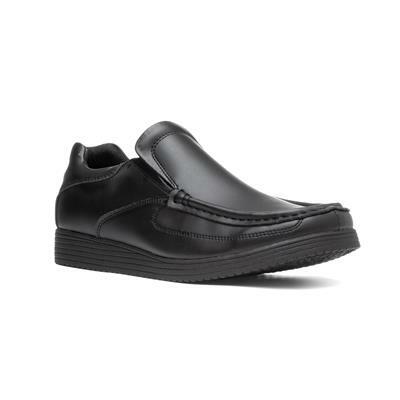 From Beckett, these mens black slip on shoes showcase a round toe, fine stitched detailing, double elasticated stretch inserts for easy fitting and a cushioned collar all on a low heel and outer sole. For your little ones with larger feet, these are perfect for daily school wear. These are wide fitting shoes, meaning they providing comfort for broader feet. My husband loved the shoes.Very good value and arrived quickly. Comfy, true to size. I always buy Beckett shoes for my son. He goes through a lot of shoes in school but these last longer than most at this price range. These shoes are a good fit and are very comfortable to the feet, the shaped heel is a bonus so no heel rub. I've have had other shoes in the past but these are fantastic & so easy to put on, very comfortable & get even better after being worn a few times. Great.